Dice Hate Me and Go Forth and Game have joined forces to bring you some of the best gaming interviews on the web! That’s right, from time to time here on Dice Hate Me, Tom Gurganus will contribute one of his comprehensive conversations. In this interview, Tom sits down for a detailed chat with Geoff and Brian Engelstein, makers of The Ares Project. Enjoy the interview and be sure to let us know if there are other designers, artists or gaming insiders that you would like to know more about! Tom: Ok, The Ares Project – It just hit stores and it’s getting good buzz on the internets. Tell us all about it. Where did the idea come from? What it is about? All the details. Geoff: Back in 2007 I (Geoff) had a business trip to Korea, and I met up with Tom Vasel of The Dice Tower to play some games. We played the Starcraft boardgame from Fantasy Flight, and while I liked it, it didn’t give me the feel of playing Starcraft on the computer, a game I loved. I started thinking about other games that were based on computer ‘real-time strategy games’ (RTS), like Age of Empires and Warcraft, and realized that there was no board game that felt like they did. So on the long flight back to the US I started thinking of ways to capture those features that I really like in computer games. There are a few features that are common to most RTS games – Each player gathers resources, constructs buildings, uses those buildings to produce units, and then attacks the enemy. These buildings and units are usually built in a ‘base’ which is hidden from the other player until they send other units to attack. And there are always a wide variety of units with strengths and weaknesses, and ways to upgrade them. Finally, there are many different strategies – you can build a lot of weak units and try to attack your opponent quickly, or try to defend your base while building up stronger units. So we had a lot of design challenges. We definitely started with the theme and no idea of the mechanics.Very early on we decided we would use a deck of cards for each faction. Cards represent the buildings or upgrades if played face up, and resources if played face down. In addition most cards can produce two different types of units depending on how you play them into your base. We also decided pretty quickly to have no map. Each player just plays cards to the table in front of them, which represents their base. You play cards face down as resources on the building cards to construct units.This kept the game really streamlined so that it preserves the feel of an RTS, with it’s fast moving play. An older version of the game actually had the players playing simultaneously until someone launched an attack, but it turned out to be way too chaotic. So instead we have a very simple turn structure – play one card, draw one card. Once you know the cards a turn is typically just a few seconds long.We also wanted to preserve the hidden information in the computer game. So we have the players playing their cards behind a screen. You literally have no idea what the other player is building until the fighting starts. We worked hard to develop a system that makes it extremely difficult to cheat while letting players make their moves out of sight of their opponent, and we think it works very well.In addition to the building and tech cards there are Attack cards. In order to launch an attack you have to play an Attack card. At this point the regular back and forth play stops and a battle between the players is fought. The players take their screens away and exchange their resources for unit tokens, which represent the actual fighting forces. We made the combat system straightforward and yet having tactical depth. The battles are the climax of all of the building, so we wanted to make sure that they were dramatic and rewarded skillful play. Also, we needed to support special abilities like scouting, tough units, screening, shields, flanking, and more. This was probably the toughest part of the game to get working properly, going through probably close to 15 different iterations. In the end we created a system we call the ‘Battle Line’, where the different forces line up against each other and fire. You have your best shot at the force directly in front of you, but can shoot at any force. However the farther away they are the harder they are to hit. That coupled with the fact that each type of unit is good against some units and bad against others means that match ups are critical and there are a lot of tactical decisions to make. Tom: Wow! I can imagine an RTS would be a real challenge for a board/card game. But it sounds like you’ve developed some pretty good mechanics that capture the feel of one. I like how the cards have multiple uses. That’s neat. The secret information solution is pretty cool. I imagine that the element of surprise when your opponent reveals his units – “Oh, man! You built that!” – is pretty awesome. I like the tactical aspect of the battle. Most people don’t think about just how much work goes into a game. You’ve put a lot of work into Ares. The Ares Project is being published by Z-Man. How did you hook up with them? Geoff: We are friends with game designer Andrew Parks (creator of Core Worlds, coming soon from Stronghold Games), who has published several games with Z-Man. He introduced us to Zev at a local game convention here called Dexcon. So we had been acquaintances for several years before showing him The Ares Project. We had pitched another game to him that we had designed called Hordes well before Ares, but it did not go well. We learned that, even for an acquaintance, you only really have one shot to interest someone in a game. 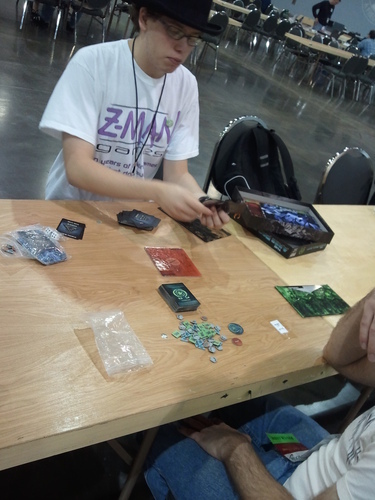 Hordes was at an early stage when we playtested it with Zev, and had some rough edges. I learned that you really need to have a well polished game prior to showing it to publishers, and so we had over two years into Ares before we showed it to Z-Man. Tom: How much ‘influence’ did Zev have? What about Ares changed from its initial inception? Geoff: Zev had just a few suggestions after his initial playtest. The game initially had three different factions, and was strictly a two player game. He wanted it to have four factions and go up to four players. We had a fourth faction already in development, the giant robot, so that wasn’t too big a deal. But we had to spend a lot of effort to come up with a multiplayer system that would avoid the pitfalls of other conflict games, where two players attack and the others just wait to pick up the pieces, or where a player may be eliminated early on. We are very happy with the system we ended up with, which is sort of a king-of-the-hill system, where playersearn points by controlling a central area, so you can’t just stay at home. We were also very pleased that it really enhanced the two-player game, giving a real sense of urgency as one player may be racking up points and the other player feels that time is working against them and may have to launch an attack before they are ready. Other than those initial suggestions Z-Man was not that involved in the development of the game. Tom: The king-of-the-hill idea is great, avoids turtling and adds that panic element and progression. It must have been a great feeling when Zev decided to pick up Ares. Describe that feeling if you can. Also as a team, what is the hardest part of designing a game? Geoff: Well, certainly there were times when we had different ideas about what would work and what wouldn’t, and what features we wanted to include. Our usual method was just to throw everything in and see what worked and what didn’t. It usually was pretty clear early on what was worth keeping, but sometimes a feature would stay in for a long time, and we would even forget why it was there! That was usually a sign that it needed to get excised. But overall we worked together surprisingly well. Brian: The hardest part for me really has to be cutting. Every idea is awesome, and each one on its own can seem amazing. Having to cut one of those because it is not fitting with the rest of the game is heart wrenching. I remember fighting tooth and nail to keep the Xenos workers in, even though in the end their removal made for a better game. Tom: Yeah, cutting parts is always hard. I’ve heard that from pretty much every designer I’ve interviewed. It’s good when you can recognize that something needs to go, though. That’s a sign of a good designer. 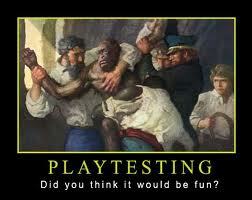 How did you handle playtesting? What is the hardest part of playtesting? Geoff: We did a lot of playtesting. We must have played the game hundreds of times. So we needed to make sure it was fun. You have to like playing your own game because you’re going to be playing it a lot. We had three ‘levels’ of playtesting. First was just the two of us. One advantage of designing a two-player game and having two designers is that it’s easy to do rapid-fire playtesting. The second level was playing with others where we looked on, or participated. That was a way to determine what was easy to understand, and get other ideas on strategies. There were several people that were really good at breaking the game, so we liked to include them where possible. The third level was the blind playtest, where we passed the game on to other folks who had never seen it before, and had them read the rules and learn how to play. This is the toughest to do, because you can’t watch them play, so you don’t even know if they were playing the rules correctly. Plus you need to rely on feedback in terms of what they liked and what they didn’t, which not everyone provides, or doesn’t provide in detail. So it’s always a challenge to really know how it’s going out in the field. Tom: It seems that the three tier playtesting scheme is pretty standard. I imagine having your design partner right there is neat. Let’s talk about the art for Ares Project. Tell us about your artists. Geoff: We worked with many different artists for different parts of the game. All were hired by Z-Man, and Zev had a lot of input about the style. For example, he wanted the cover to look like an 80’s movie poster, and we think it came out pretty cool looking. We had separate artists for the screens, cards, rules, and other items. That helped get things done a little quicker, but perhaps it has a bit of a hodge-podge look to it. Tom: I think the art is quite good. I like the monochrome factions. There’s a lot of iconography. Any feedback about that? Geoff: I’m glad you like the art! I am absolutely in love with the artwork for the screens. Also, I am partial to the card art myself, but I know it’s not everyone’s cup of tea. Originally we were not going to have art on the cards. Since each card can produce two different units and can be rotated 180 degrees we felt they would be too cluttered and confusing with artwork of the actual units it could produce. But when we posted the original card samples to BGG the feedback was universally that they were too bland. So we hit on the idea of adding a top view of buildings, so it would look like you were actually building up a base. I think the icons are pretty clear. It may look a bit confusing at first, but after a few turns most players are very comfortable with it. Tom: I like to ask these next two questions of all my guests. First, what are some aspects of a good player? Geoff: Someone who takes the game seriously, but not too seriously. Brian: A good player wants to see every facet of the game. They don’t just stick to one play style every game, preferring instead to try a different way to place each time. Ares all but demands this, as otherwise you will not see all the game has to offer. Tom: Second, what makes a good game? Geoff: A good game engages the player, keeping them interested and focused. That can be done a lot of ways, and is different for everyone. But for me, I most often get engaged when I have a series of deep choices that requires tight interaction with the other players. Brian: A good game needs to have a sense of progression. I dislike games that have you making the same choices at the beginning of the story that you do at the end. This is why I love games with RPG elements, even if it just comes down to building up a town, and I always push for the abilities in Dominion and Puerto Rico. Tom: Those are excellent points. A sense of progression is an idea that is getting a decent bit of discussion of late. I too like games that have hard decisions. You both have been playing games for a long time and therefore have probably played a lot of games. Whose work in the industry do you admire the most? Geoff: I’m a huge fan of Vlaada Chvatil. Not only did he design one of my top games, Through The Ages, but he has such a diverse body of work. There are some designers that have a ‘trademark’ game style, but Vlaada’s games span such a dramatic range of topics and styles. Brian: I have really been a fan of David Carl, the creator of the game WARMACHINE (yes, it has to be in all caps, that’s the rules). The rules are really interesting, and even though it is a minis game it has a lot of interesting choices and tactical decisions. Tom: I’ve not played any of Vlaada’s games I don’t think. I need to remedy that. And Brian, a minis game? Interesting. What are you currently playing? Geoff: Playing lots of different things as always. Newest thing I’m really enjoying is A Few Acres of Snow by Martin Wallace. Brian: Same for me, also a lot of Minis stuff like WARMACHINE and Infinity. Finally, my friends have been getting back into MTG. Yes, I am Ameritrash, sue me. Tom: Man, I really want to play A Few Acres of Snow. Is it as good as they say? And as far as minis go, Dystopian Wars and Malifaux look really tempting? What’s the coolest part of being a game designer? Geoff: Getting to see other people experience your ideas and hopefully have a good time doing so. Which is also the scary part, I guess. Also, getting to say that I am a designer is great. Walking up to someone with your game and asking them how it is for a candid reaction is always fun, and it is surprisingly enjoyable to teach your own game. Tom: I know you attended Origins this year and had Ares with you. How did it go? GenCon? Any other cons people might run into you at this year? Geoff: We were at both Origins and GenCon. It was a blast seeing the game get out there and tried by lots of people. We did a ton of demos and really honed it down to a science. Our next con probably won’t be until January, when we go to Dreamation in Morristown, NJ in January. Brian: If I get into college by then, some friends and I may also go to PAX East, so say hi if I am there. Tom: Tell us about your current/future projects. Geoff: We’ve got a few projects in the works, including one that is pretty close to finding a publisher, we hope. We playtested it at Origins and Gencon and it was very well received, so we hope that it will get out there and be popular. But we’ll keep it somewhat under wraps until then. Tom: Any further developments on these? Any chance of breaking some news? Geoff: We’re working on a design now that we’re very excited about. It may be picked up by a publisher shortly, but nothing definitive yet! Tom: Are there any links or sites you want to direct us to? Geoff: I hope people check out the podcasts I am on: The Dice Tower, at www.dicetower.com, and Ludology, at www.ludology.net. Tom: I will check out Alteil, Brian. Thanks for mentioning it. And I’m a regular listener of The Dice Tower and its affiliates. I can highly recommend them all. Well guys, I had a blast learning about you both and The Ares Project. I can’t wait to see what is next from you. You can find out more about The Ares Project at Z-Man Games and BGG. It is now available at FLGS everywhere and at your favorite online stores. Join me again soon for more gaming goodness at Go Forth And Game.